A great new way to save money on meat by using the power of community. Partner with your friends or neighbours and buy our free range, hormone free beef, bison, lamb and pork in bulk. Whether you are a meat connoisseur or just looking for a great deal on meat, joining the Windsor Meat Club will allow you to get premium quality meat at extraordinary savings. Get together with your friends, neighbours or other meat lovers, order a fore quarter, hind quarter or full side of meat and start saving today! Here are the animals available for Meat Club purchase. Visit or call our store and just tell us what you need along with a 50% deposit. We will contact you when it arrives and arrange a pick-up date. 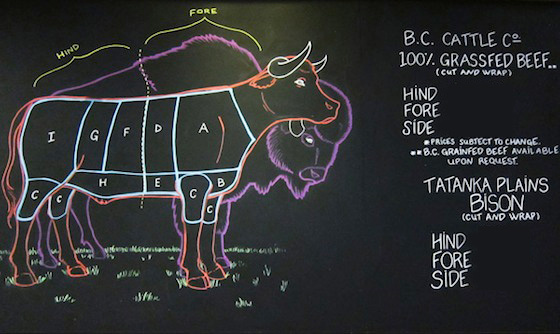 With the Windsor Meat Club you are getting premium cuts of steak, roasts, stewing cubes, etc. for a set price per pound for the whole section. Therefore, every cut costs the same per pound whether it is prime rib or ground beef. After the animal arrives we can even age it for you at no extra charge! That’s another benefit of the Meat Club. We have the room in our large cooler to age your beef or bison, giving your quality meat an added boost of flavour and incredible tenderness. Would you like us to process some of your beef, pork, bison or lamb into sausages, bacon, corned beef or cooking lard? For a fee, we can customize your order to include succulent hand made sausages and other goodies. Just call us for details. You can satisfy your inner carnivore, eat healthy, quality, free range meats and enjoy great savings by joining the Windsor Meat Club. Use the contact form on our web site below. Due to the volatility of the of the beef market at present, we are regularly forced to adjust the per pound price of sides and quarters of beef. If you are interested in buying bulk beef, call the shop and we will be able to give you a quote that reflects the current market situation. We apologize for any inconvenience but this is the only way we can offer a fair price.